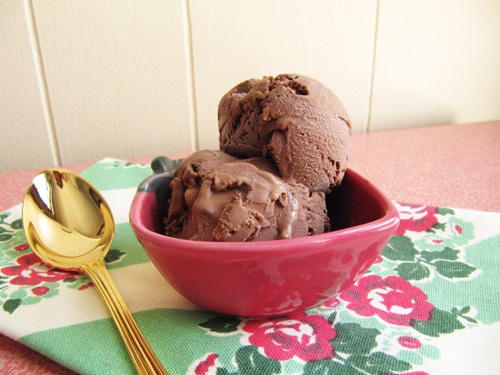 Chocolate ice cream is my favorite ice cream of all the ice creams. Jake’s been asking me to make it ever since I made vanilla for our hot fudge sundaes while there was snow on the ground. I’m a total jerk for waiting this long to make it. I know that now. That photo up there is what the base looks like before it’s refrigerated for hours. That’s my face reflected in it’s lovely brown surface. Down there is what it looks like after chillin’ in the fridge. It gets nice and thick. I had to whisk it vigorously to be able to pour it! We tasted this right out of the ice cream maker. We tossed spoons willy-nilly in the sink. We forgot about how it was over 90° in our upper flat. Basically, this ice cream is smooth like a criminal, tastes like a dream, and I love it so much I’d marry it. Place the chopped chocolate in a medium heat-proof bowl, set aside. Meanwhile, warm 1 cup of the cream with the cocoa powder in a medium saucepan. Whisk it briskly to blend in the cocoa. Bring it to a boil, then reduce the heat and simmer at a very low boil for 30 seconds, whisking constantly. 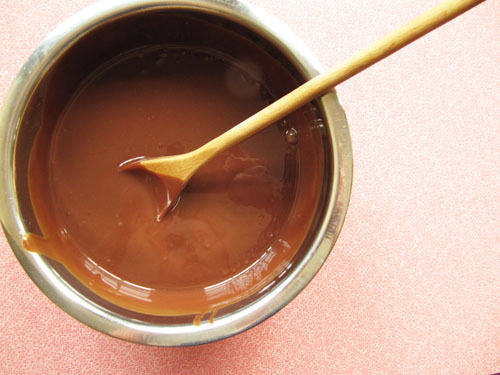 Remove from the heat and pour over the chopped chocolate, scraping the saucepan as clean as possible. 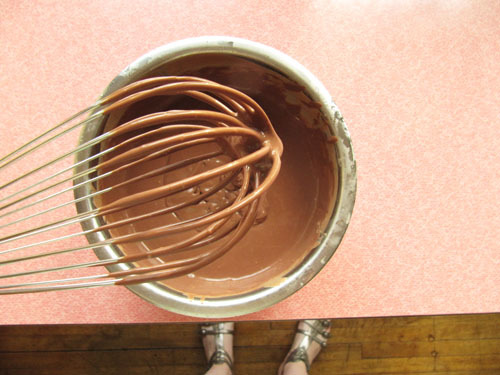 Whisk the cream and chocolate until smooth. Stir in the remaining 1 cup of cream. Set the bowl aside with a mesh strainer on top of the bowl. Warm the milk, sugar, and salt in the same saucepan you just used. In a separate medium bowl whisk the egg yolks. Slowly pour the warm milk into the egg yolks, whisking constantly. Scrape the warmed egg yolks back into your saucepan. Stir the mixture constantly over medium heat with a heatproof spatula, scraping the bottom as you stir, until the mixture thickens and coats the spatula. Pour the custard through the strainer and mix into the chocolate mixture until smooth, then mix in the vanilla. Stir until cool over an ice bath. Chill the mixture thoroughly in the fridge, then freeze in your ice cream maker according to the manufacturer’s instructions. If the mixture is too thick to pour into your machine, whisk it speedily to thin it out. I like to watch the ice cream churn. I get really excited about it. I need an ice cream maker. I want to be hit by a smooth criminal. This looks amaze-balls. PS- I love your feet and food shots. Thanks Zoe! Being hit by a smooth ice cream criminal is where it’s at. ha! now i need to listen to some classic michael…and buy my ice cream maker already! jeez. i’m glad you made the chocolate ice cream…next is vietnamese coffee!! i’m loving that strawberry bowl with the golden spoons. Ooh, I want that Vietnamese coffee ice cream meringue magic cake you made so bad! 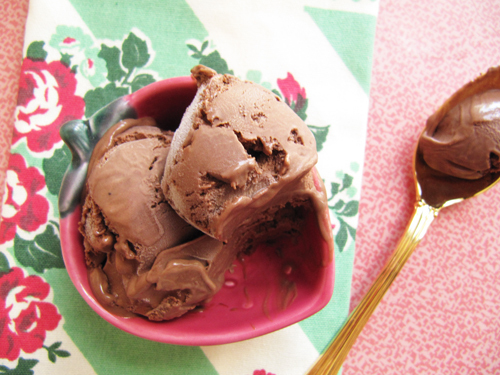 homemade chocolate ice cream tastes so much better than the store bought variety. Its more intense and less sweet. This looks soooo goooood! Yes! You’re so right! It’s the dreamiest.